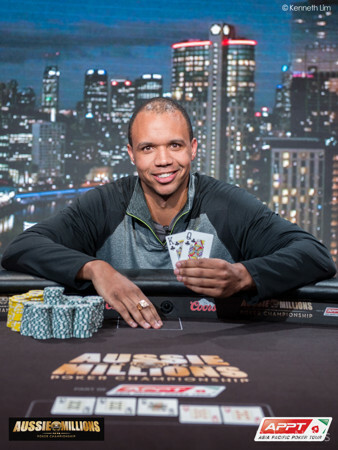 Phil Ivey wins for a third time! Back in 2012, Phil Ivey topped a field of 16 entries to win the LK Boutique $250,000 Challenge for AU$2 million, and two years after that he'd win it again by outlasting a field of 46 entries to capture the AU$4 million first-place prize. Those were impressive feats, but now Ivey has done the unthinkable by defending his title to win the prestigious event for the third time in four years, not to mention the AU$2.205 million top prize. That means the three largest cashes of Ivey's career have all come from the Aussie Millions' AU$250,000 Challenge. This year, Ivey conquered a field of 25 total entries, which climbed from Day 1's 23 thanks to one late registrant, Brian Rast, and a reentry from Isaac Haxton. That created a prize pool of AU$6.105 million that was distributed to the top five finishers. The day began with a flurry of action at Table 10. In fact, the first three hands of the day resulted in three eliminations. The first to go was the short-stacked Ole Schemion, who shoved with the and failed to overcome the of Doug "WCGRider" Polk. In the next hand, Igor Kurganov got it in with sixes only to run into Polk's pocket sevens, and one hand after that Rast shoved with the and lost to the of Haxton. That meant Rast, who finished fifth in the Aussie Millions Main Event the day before, got to play three hands for his AU$250,000 buy-in. After Jason Mo ran the into the of Scott Seiver to bust in ninth, the final table of eight was set. From there, Dan Smith fell when his failed to crack the of Ivey, and then Ivey got lucky with the to eliminate Isaac Haxton, who held the , in seventh place. Not long after, the bubble burst in Level 11 (12,000/24,000/3,000) when Richard Yong, who two days prior topped a field of 70 entries to win the $100,000 Challenge for AU$1.87 million, three-bet all in for 307,000 over the top of Ivey's open to 55,000. A call was made, and the cards were tabled. Yong was ahead, but Ivey was drawing to two live cards. The flop kept Yong in the lead, but then the dealer burned and turned the to pair Ivey. Yong needed an ace on the river to survive, but it wasn't meant to be as the bricked. 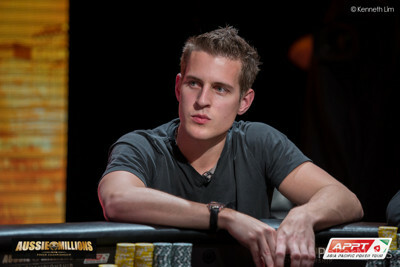 Yong left empty-handed in sixth place while the remaining five players were guaranteed at least AU$551,000. Former $250,000 Challenge champ Erik Seidel was the first in-the-money elimination after getting his short stack in with the only to run into the of Polk. The board ran out a clean , and Seidel was out in fifth. It took a little while for the next elimination to occur, but it happened when Mike "Timex" McDonald made a flush on the turn to knock out Seiver, who had fired three bullets into the event. 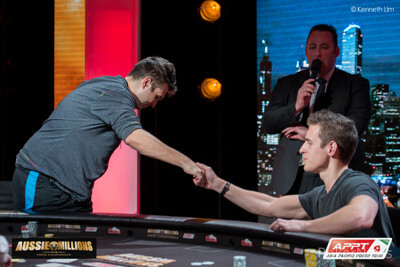 That means with the AU$735,000 prize Seiver received for his fourth-place finish, he only lost AU$15,000. In the first hand back from the dinner break, Polk three-bet all in with the only to have McDonald four-bet all in over the top with the . Ivey, the initial raiser, got out of the way, and the flop came down . Even though McDonald flopped top pair, Polk picked up a flush draw and a pair of his own. Polk had two pulls to get there, but ultimately he was left wanting as the blanked on the turn followed by the on the river. Heads-up play began with Ivey holding 3.61 million in chips to McDonald's 2.64 million, but the defending champ was able to whittle away his opponent before getting lucky to finish the job, which Ivey acknowledged in his winner's interview. The final hand happened when McDonald raised to 100,000 and then snap-called off for approximately 1.3 million when Ivey moved all in. McDonald was in a great spot to double, but then the flop came down . Ivey paired his king, and suddenly McDonald was in need of either an ace, jack, or some other lucky runout of the cards. The turn wasn't what he was looking for, and neither was the river. With that, McDonald finished as runner-up for just under AU$1.6 million, while Ivey successfully defended his LK Boutique $250,000 Challenge title. It also moved Ivey into third place ahead of Dan Colman on the all-time money list. That does it for PokerNews' coverage of the 2015 Aussie Millions, but our PokerNews Live Reporting team is currently in France covering the European Poker Tour Deauville, which you can follow by clicking here. In what would be the last hand of the tournament, Mike "Timex" McDonald raised to 100,000 from the button and then snap-called off for right around 1.3 million when Phil Ivey announced that he was all in. McDonald was in a great spot to double, but then the flop came down . Ivey paired his king, and suddenly McDonald was in need of either an ace, jack or some other lucky run out of the cards. The turn wasn't what he was looking for, and neither was the river. McDonald finished as runner-up for AU$1,592,500 while Ivey has successfully defended his LK Boutique AU$250,000 Challenge title, while also winning it for the third time in four years! After Mike McDonald raised to 115,000 on the button, Phil Ivey called to see the flop come down . Both players checked, and the turn was the . Ivey checked, and McDonald bet 125,000. Ivey woke up with a check-raise to 350,000, and McDonald called. The completed the board on the river, and Ivey led with a big bet of 600,000. McDonald made the call, but he couldn't beat the that Ivey showed for two pair and lost the pot. Ivey pulled in the chips and improved to nearly 5 million. Phil Ivey raised to 125,000 on the button, and Mike McDonald called from the big blind to see the flop come down . Both players checked, and the turn was the . Both checked again, and the river was the to pair the board. McDonald checked, Ivey bet 100,000, and McDonald called. McDonald showed the for two pair, and Ivey mucked his hand. On the button, Mike McDonald raised to 115,000. 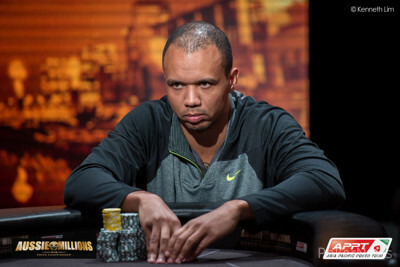 Phil Ivey reraised to 350,000 from the big blind, and McDonald folded. On the next hand, Ivey opened to 125,000 on the button, and McDonald called from the big blind to see the flop come down . McDonald had checked in the dark, and then Ivey bet 150,000. McDonald folded. After several small pots were exchanged, the first big blow went Phil Ivey's way, as he took a chunk of chips from Mike McDonald thanks to picking off a river bluff after McDonald tried to pick up the pot with a bet following a missed flush draw. On the flop, McDonald checked, and Ivey bet 125,000. McDonald called, and the turn was the . Both players checked, and the river was the . McDonald led with a bet of 300,000, and Ivey tank-called. McDonald showed the for ten high, and Ivey showed the to take down the pot with two pair. After a few small pots were played out as the two players tested the heads-up waters, Mike McDonald upped the preflop aggression with the first three-bet of the duel. After Phil Ivey made it 125,000 to go, McDonald bumped the action to 400,000. Ivey folded. Not to be outdone, Ivey was the one three-betting on the next hand. McDonald had opened the button to 115,000, and then Ivey three-bet to 350,000. McDonald folded, and Ivey won the pot. 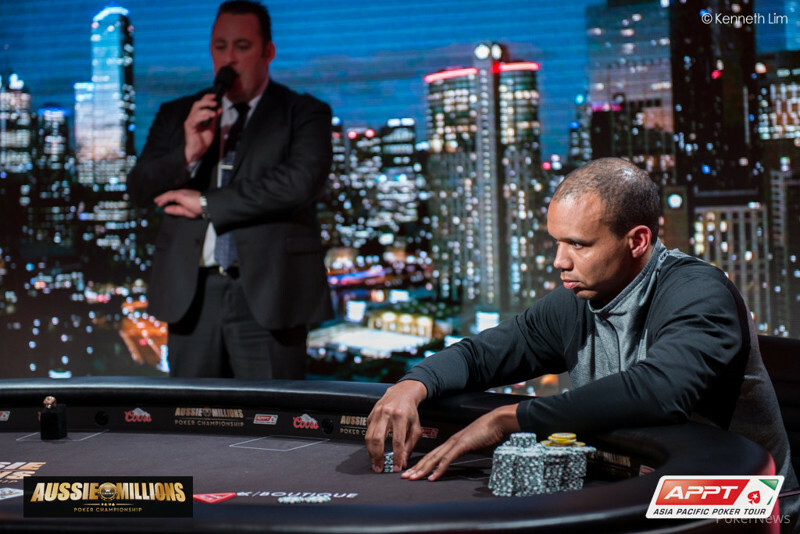 In the first hand back from the dinner break, Phil Ivey raised to 110,000 from the button only to have Doug "WCGRider" Polk three-bet all in from the small blind for 890,000. Mike "Timex" McDonald thought for a few moments before moving all in over the top from the big blind, and that inspired Ivey to ditch his hand. Polk was in trouble, but he got some help on the flop. Even though McDonald flopped top pair, Polk picked up a flush draw and a pair of his own. Polk had to pulls to get there, but ultimately he was left wanting as the blanked on the turn followed by the on the river. Who Will Win the LK Boutique $250,000 Challenge? It's Time for the Big, Bad LK Boutique $250,000 Challenge! Phil Ivey wins the LK Boutique $250,000 Challenge. Phil Ivey finishes off Mike McDonald.